When you wake up in the morning, do your knees feel stiff and rusty? You aren’t the only one. In fact, knees are the most commonly injured area of the body. That’s because the amount of pressure on your knee joints is greatly compounded when you move. When you walk up the stairs, the pressure on your knees is four times your body weight. That’s a lot to ask of our knees. You’ve got these knees for the rest of your life, so you need to do whatever you can to take care of them and keep them in tip-top shape. Even if you already have knee troubles, you can strengthen the muscles around your knee joints to make them stronger and reduce the risk of injury. Exercise also helps to prevent stiffness. 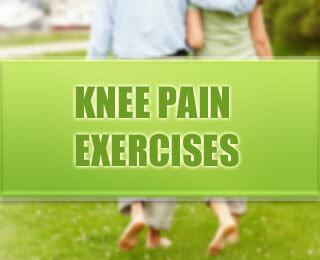 With those things in mind, try out these knee pain exercises. Chair knee extension: Sit in a chair with another chair in front of you. Place your foot on the second chair, with your knee slightly bent. Use your leg muscles to push the bent knee gently downward. Hold this pose for 5 – 10 seconds. Do five reps on each side. Heel slide knee extension: Lie on the floor on your back. Place your left foot flat on the floor, and keep your left knee bent. Take your left heel, and slide it downward so that both legs are parallel. Hold this pose for 5 – 10 seconds. Do five reps on each side. Knee flexion: You will need a bath or beach towel for this stretch. Sit in a chair with your feet on the ground, and loop the towel around one foot. Lift the towel, bending the knee and lifting the foot off the floor by about 4 – 5 inches. Hold this pose for 5 – 10 seconds. Do five reps on each side. Hamstring stretch: Stand with a chair next to you that you can hold on to for support. Put one foot out in front of you with your toes facing up. On the opposite leg, bend the knee and hip, but not the lower back. Do this until you feel a stretch in your hamstring. Hold this pose for 5 – 10 seconds. Do five reps on each side. Wall slide: Stand with your back against a wall and your knees bent. Slide your body down the wall, and then slide back up again. You can place your hands against the wall to help you balance. The knees should not extend past the toes. Bent leg raises: Sit in a chair, and extend one leg out in front of you in the air. Do not lock the knee. Hold the leg in the air for one minute, and then bend the knee to lower the leg halfway to the floor. Hold the leg in that position for another 30 seconds. Relax and return to beginning position. Step ups: You will need stairs or a low bench for this exercise. Stand in front of the stairs, and step onto them. Straighten, but don’t lock, your knees. Step down again. Repeat for one minute, increasing your time as you are able. You can pump your arms or hold light weights in your hands as you do this. If you suffer from knee pain, exercise can be a great aid. You should also make sure that you are wearing supportive footwear and insoles or orthotics, if necessary. Visit Foot Solutions to find the supportive footwear that you need for your exercise programme and daily activities.